I am having some issues with trying ti install the Network on a new Mega. I was able to install the firmware without issue. I installed the FR version as the Mega has a 5500 Card on board. 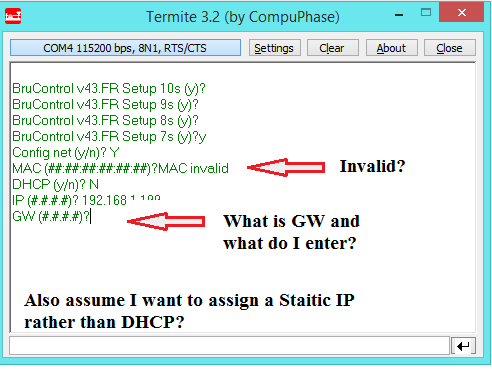 I can get the Termite Program to open and I type in "0&15;" without the quotes and I get "#&23;" in the Terminal. Type y does not seem to do anything. Does not seem to make a difference if Ethernet cable is attached or not. Partially found my answer. Code is "%0&15;"! But now I am stuck at the MAC Address: There is no MAC address on the Mega with on Board Ethernet that I can see. Do I just generate one? Yes, the correct control code is '%0&15;', without apostrophes. If the board you have came with a MAC address, it will be on a sticker. Knowing the board you have does not have one, you can just pick or generate one. I suggest you use the one in the test report for consistency. Not sure what you mean by "one in the test report for consistency" ? What "test report"? I will try one from a Mac Address generator. If you bought an assembled interface from us, it came with a test report, and on that report is the MAC addressed used. No matter though - you don’t even need to generate one. You can just pick an arbitrary one and it will work fine. I mentioned consistency, and suggest you don’t continually change it, as the computer will associate the MAC and IP of network devices, and changing these may require a computer reboot to be able to communicate. It is a Different RobotDyn Mega I am working on. I used a generated Address that I did not see on ARP -a. It says mac invalid. I proceeded. Not sure about using DHCP or not (normally I would). I decided to assign an Address. Then it asks for GW. I have no idea what that is. 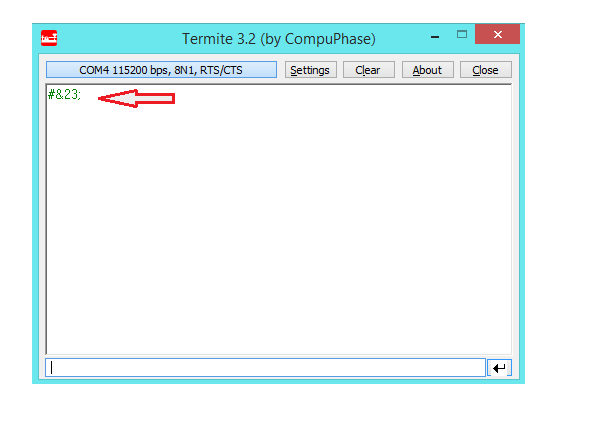 Are there other things it will ask for in the Termite? I could not find a reference to GW in the User Manual. GW is Gateway and SN is Subnet. I think it is smarter to use static IP so the address doesn't change. Either that or make sure your router always assigns the same IP, which they can usually do based on the MAC address. Ok Found the issue. I thought that GW might be Gateway but it looked like only 4 digits. When I looked at the Test Report, I saw it right away. Not to mention much larger text! I did re install the firmware but that did nothing. When I try to connect the Mega using the IP I thought I had used, it will not connect. Not sure... make sure all the hardware is removed from the interface, re-install the FW (and make sure it actually installed - look for text that says it uploaded and was verified). Regarding your second point... I mentioned earlier that changing IP/MAC combinations is a bad idea, because your computer's IP translation table will get messed up. Rebooting your computer and resetting the interface should solve it when that happens.